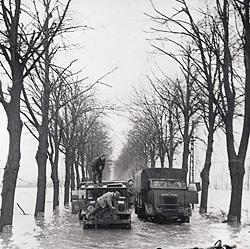 Vehicles from the 3rd Canadian Infantry Division negotiate a flooded road near Cleve, Germany, in February 1945. The operations carried out by 1st Canadian Army in the Rhineland during February and March 1945 involved as many Canadian units as fought in the last weeks of the Normandy campaign, but very little is known about their experience. This is the first of a series of essays designed to offer some insight into both command decisions and the soldiers’ experience of war in the Rhineland. The broad outline of Allied strategic plans for 1945 were agreed upon in January once it was clear that the German offensive in the Ardennes–the Battle of the Bulge–had lost momentum and would soon be crushed. The Supreme Allied Commander, Dwight D. Eisenhower, flatly refused General Bernard Montgomery’s proposal that he be placed in charge of the American forces for the next offensive but Eisenhower did agree to assign the U.S. 9th Army–12 divisions strong–to Montgomery’s army group. Montgomery was to clear the west bank of the Rhine in a vast pincer movement employing General Harry Crerar’s 1st Cdn. Army in the north and Bill Simpson’s 9th U.S. Army in the south. 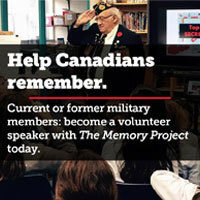 The Canadian operation was code-named Veritable while the American operation was called Grenade. Unfortunately the enemy reacted to the first signs of an offensive by opening the Roer dams and turning the river Maas, which the Americans had to cross, into a raging torrent one thousand metres wide. Operation Grenade had to be postponed, but Veritable went ahead as planned. Crerar and the staff of 1st Cdn. Army had been preparing for Veritable since November. The original plan, to launch the offensive with Lieutenant-General Brian Horrock’s 30 British Corps and use 2nd Cdn. Corps in a supporting role, had been modified under pressure from Lieutenant-General Guy Simonds who argued that “to leave the Canadians out of so important and decisive a battle would be a bitter disappointment to the troops.” The troops were not asked if they agreed with Simonds’ views, but he won his case and both 2nd and 3rd Cdn. divisions were committed to the opening phase of the battle. By February the ground was very wet and very muddy. Rain and grey skies covered the battlefield and this limited the air support that could be provided. Army intelligence reported that Major-General Heinz Fieburg’s 84th Infantry Division, with a strength of 10,000 men, had placed all seven of its battalions in line across the six-mile front. The division controlled 100 field guns and could call upon 36 self-propelled anti-tank guns for immediate support. Unfortunately for 30 Corps, General Alfred Schlemm, commander of 1st Parachute Army, sent 2nd Parachute Regiment to the Reichswald two days before the attack to take over the left flank thus allowing Fieburg to create local reserves. The 2,000 men of 2nd Parachute Regt. provided exceptionally strong resistance in the first days of Veritable, slowing the advance of 51 Highland Div. in the one open area where rapid movement might have been possible. The Anglo-Canadian plan for Veritable involved the massive application of force to a narrow constricted battlefield and 1st Cdn. Army was responsible for the development of an elaborate supply system to make this possible. By 1945 the Canadian army’s engineers and staff officers were among the best the Allied armies possessed. Crerar paid tribute to their work in a press conference which detailed the size and scope of the buildup necessary for the operation: “1,880 tons of bridge equipment have been used in the construction of the five military bridges which have been thrown across the River Maas, and lead into the forward assembly area. The Ravenstein “high level” pontoon bridge–known as the Quebec Bridge, is the longest Bailey bridge yet constructed–1,280 ft. long. “British and Canadian sappers in the past few weeks have constructed, widened and improved approximately 20,000 tons of stone, 20,000 logs and 30,000 pickets have been used. To move troops and their fighting equipment and supplies into position prior to D-Day (the day of the attack) will involve 35,000 vehicles travelling an average 130 miles each and using approximately 1,300,000 gallons of petrol. “Demands have entailed the production of over 500,000 air photographs and 15,000 enlargements. Over 800,000 special maps, requiring over 30 tons of paper, have been produced. If the ammunition allotments for the operations, which consists of 350 types, were stacked side by side and five feet high, it would line a road for 30 miles. The total ammunition tonnage, provided for the supporting artillery from D-Day, to D-Day plus 3, would be the equivalent in weight to the bomb-drop of 25,000 medium bombers. Horrocks proposed to use all of this manpower and high explosives in a sudden, massive attack by three British divisions, each of which would concentrate its energies on an exceptionally narrow front. The Guards Armoured Div. and 43 (Wessex) Div. were in reserve, ready to pass through and exploit south in the early stages of the attack. This account of the Canadian role in Veritable should not obscure the fact that the overwhelming majority of men involved in the battles of February were British troops fighting under their own leadership in 30 Corps. Casualties to the British forces in February were four times higher than the Canadian total. The 2nd Cdn. Inf. Div. had occupied the area through which 30 Corps was to attack for some weeks. There had been ample time to study the limited task assigned to the Blue Patch division–the capture of a triangle of territory south of the Nijmegen-Cleve road near the German village of Wyler. Once this fortified area had been seized, divisional engineers would open the road and hand over to 15th Scottish Div. which would use the route to support its advance. The division was under the command of Maj.-Gen. Bruce Matthews, a peacetime militia officer who had spent the war in a series of Royal Canadian Artillery appointments, including Commander Royal Artillery of 1st Div. in Italy and Commander Corps Royal Artillery for 2nd Cdn. Corps, from Normandy to the Scheldt. Matthews was an aggressive, self-confident officer who had no doubts about his ability to command an infantry division. Indeed, given the kind of artillery-based operations used in the Allied armies, the appointment of a senior gunner officer appeared to be long overdue. Matthews selected 5 Inf. Brigade to undertake the attack on Wyler and Brigadier W.G. Megill gave the main task to Lieutenant-Colonel Ross Ellis and the Calgary Highlanders. By February 1944 the Calgaries were one of the most consistently effective battalions in 21 Army Group. Their assault, supported by two companies of the Régiment de Maisonneuve, involved a quick thrust to the Cleve road before turning north to attack Wyler from the rear. The two lead companies ran into a minefield, taking heavy casualties but were astride the road and in contact with 15th Scottish Div. by noon. The attack on the village of Wyler required a long agonizing period of close fighting. Dugouts constructed in the dike banks gave the enemy near total protection from the preparatory artillery barrage. Most of the seven officers and 308 German soldiers captured during the day surrendered only when the infantry, working closely with 5 Cdn. Field Regt. and the Toronto Scottish Regt’s 4.5-inch mortars, fought their way into the village. The Calgaries lost 67 men, including 15 killed. The Maisonneuves, who seized the villages of Den Heuvel and Hochstrasse, thereby extending the flank of the attack, had two killed and 20 wounded. This little battle was a microcosm of the fighting on Feb. 8. Historians, noting that Horrocks employed five divisions on a five-mile front, held by the equivalent of one and one-third German divisions, usually speak of the overwhelming strength of the Allies in Veritable. To the Calgaries attempting to break into Wyler, or the British battalions spearheading their divisional advance, the operation appeared far less one-sided. General Dan Spry’s 3rd Cdn. Div., now known as “the water rats”, had the task of clearing the area between the Nijmegen-Cleve road and the Rhine so as to protect the left flank of the main advance. During the week before D-Day, Feb. 8, a thaw had softened the Rhine flood plain and breaks in two major dikes added to a flood of water that gradually submerged the battlefield the Canadians were supposed to manoeuvre over. The 79th Armoured Div. was quickly called upon to supply Buffaloes and 3rd Div. was reintroduced to the amphibious vehicles which had been so valuable in the Scheldt operations. Jock Spragge’s 7th Bde. had been assigned to seize the Quer Dam, a natural defensive position which dominated the front. German tunnelling efforts had weakened the dam causing its collapse and increasing the flooding, but at either end of the dam companies of 1052 Grenadier Regt. were dug in. The Regina Rifles had little difficulty in taking the southern post and were able to advance on the village of Zyfflich with the aid of artificial moonlight supplied by searchlights reflecting off the low lying clouds. The flood waters had not yet submerged the approach to the village and the Reginas were accompanied by a troop of Shermans and a Flail tank which led the procession, clearing mines. Two companies of the Reginas, working with cool professional caution, cleared the village by midnight, taking over 100 prisoners at a cost of one officer killed and 12 men wounded. The Canadian Scottish Regt. attacked the northern end of the dam, sending one company on foot along the face of the dam while two platoons, mounted in Buffaloes, circled around and attacked from the southwest. The Royal Winnipeg Rifles completed clearing the area. On the left or Rhine flank of the divisional sector, 8th Bde. directed an operation which mounted the North Shore (N.B.) Regt. on Buffaloes for a quick strike to a dike barrier and the village of Zandpol. “Booby traps inflicted most of the casualties while the regiment was clearing the dike and when the enemy showed signs of life B Company asked for a five-minute fire plan on Zandpol to quiet it down.” The 13th Field Regt. obliged and the North Shores entered the village without meeting any resistance. The Régiment de la Chaudière took the next bound to Leuth, but resistance was growing and several small counterattacks had to be beaten off first. Brigadier J.M. “Rocky” Rockingham’s 9th (Highland) Bde. waited until the afternoon of D-Day plus 2, Feb. 10, to start the second phase of the operation. The Stormont, Dundas and Glengarry Highlanders advanced along the southern edge of the flooded area using Buffaloes to reach their objective, the Spoy Canal. Out amidst the floods the Highland Light Infantry of Canada was involved in a miserable, costly struggle for the village of Duffelward. This tiny Rhineland hamlet was the northernmost position of the Seigfried Line, with fortified houses and flood waters swirling in between. The weary HLI were pressed forward by a barrage of orders from division and, at midnight, two companies were in position on the bank of Spoy Canal. The brigade’s reserve battalion, the North Nova Scotia Highlanders was ordered to cross the canal and occupy Kellen. “After wading through knee to waist-deep water in various spots…they established themselves without meeting any resistance.” They waited there, isolated among the floods, facing east to the Rhine. On the 14th the North Novas conducted the last operation of the first phase of Veritable, putting in an amphibious attack across the Alter Rhine, capturing the ferry-crossing opposite Emmerich. On Feb.15, 3rd Div. reverted to the command of 2nd Cdn. Corps. While 3rd Div. struggled to complete its tasks the British divisions were experiencing some of the heaviest fighting of the war. On the Canadian flank, 15th Scottish Div. had been asked to squeeze two brigade groups into the narrow zone between the Reichswald and the flood waters. The road to Cleve was the axis of their attack and their main task was the seizure of the curved ridge overlooking the ruined city. With the road flooded to depth of two feet, operations were at a standstill when Horrocks decided, on the basis of information that part of the ridge had been captured, to order the 43 (Wessex) Div., to pass through the 15th Scottish and burst out onto the plain beyond. In his memoirs, he admits that this decision was “one of the worst mistakes I made in the war” because the arrival of 43 Div. “caused one of the worst traffic jams of the war” and made the Scottish Division’s task even more difficult. Veritable was turning into a bloody attritional battle which the British army could ill afford. Since the Americans still could not cross the Maas the enemy was free to employ its armoured reserve, 15 Panzer Grenadier and 116 Panzer Div. against the British. The German counterattacks failed but by the night of Feb. 13 it was evident that the British-Canadian offensive had stalled. It was time for Montgomery, Crerar and the Corps commanders to think it out again.